It’s going to be a warm one… The forecast calls for temperatures hovering close to 90 degrees through the weekend but back to 80 degrees next week. ABOUT: Backyard Bard (a program by GreenStage) brings Shakespeare to small parks around Seattle in 45 minute, four-actor, family-oriented performances. 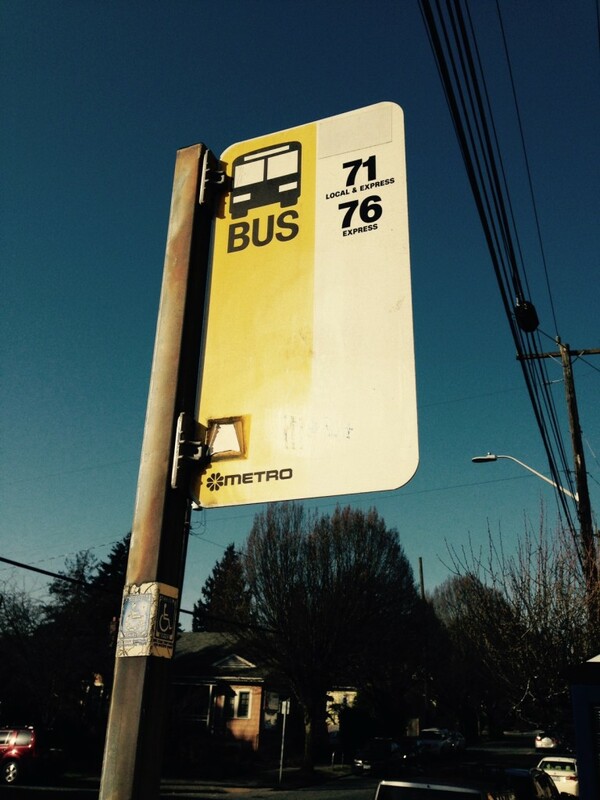 DETAILS: Cowen Park, 6504 20th Ave NE. 7 PM. FREE. Donations accepted. ABOUT: Buy, sell, and trade VHS tapes, DVDs, posters, t-shirts, and other horror-related memorabilia and collectibles. Other screenings and events can be found on their calendar. DETAILS: Scarecrow Video, 5030 Roosevelt Way. 2-8 PM. FREE. ABOUT: Carnival games, a bouncy house, face painting, bingo, etc. DETAILS: Ravenna Eckstein Community Center, 6535 Ravenna Ave NE. 1-3 PM. $3 per child. ABOUT: Mary follows her acclaimed debut The Good Girl with psychological thriller, Pretty Baby. DETAILS: Ravenna Third Place Books, 6504 20th Ave NE. 7-8 PM. FREE. ABOUT: Music, beer garden, kids activities, and samples from U Village restaurants. DETAILS: University Village parking lot. Wednesdays, July-August. Doors open at 5:45, show 6:30-8:30 PM. FREE. ABOUT: Craig reads from his collection of personal essays, Passing on Curves: While Death Rides Shotgun, adapted from onstage performances. ABOUT: Movies on a big screen, live entertainment, trivia, and food trucks on Thursdays evenings from July 9 – Aug. 27, 2015. Bring your own lawn chair or blanket and event is dog friendly. DETAILS: Magnuson Park (grass athletic fields), 7400 Sand Point Way NE. Doors open at 7 PM, movie starts at dusk. $5 per person. Kids 5 and under are free. DETAILS: The Burke Museum of Natural History and Culture, UW Campus at 17th Ave. NE and NE 45th St. Open daily, 10 AM-5 PM. Activities included with museum admission, $7.50-10. The forecast calls for temperatures in the upper 70s and some clouds this weekend. ABOUT: The outdoor art festival features local arts and crafts, entertainment, food, and children’s arts activities. DETAILS: Our Lady of the Lake Parish and School, 3520 NE 89th St. Saturday and Sunday, 10 AM-5 PM. Entry is FREE. ABOUT: “Teens are invited to join us for popcorn and a screening of this Tim Burton ’80s classic.” – SPL Website. Free movies showing this summer at several library locations around Seattle. 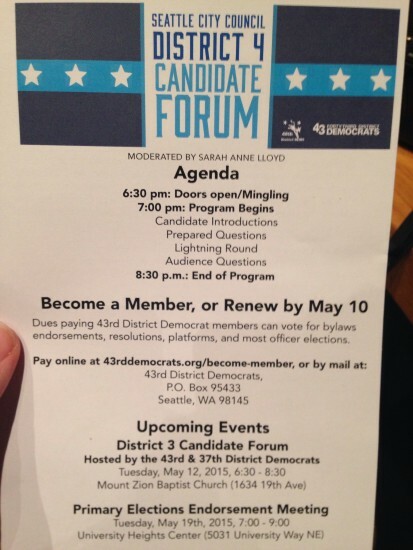 DETAILS: Northgate Branch Meeting Room, 10548 Fifth Ave. N.E. 2-4 PM. FREE. ABOUT: This is the final movie in Americans Abroad: A Globetrotting Film Series at the University Branch. Free movies showing at several library locations this summer around Seattle. 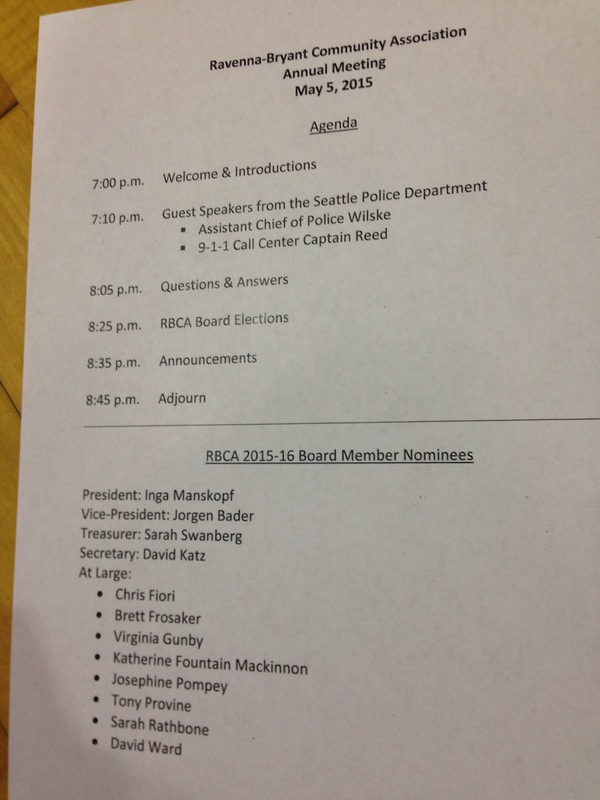 DETAILS: University Branch Meeting Room, 5009 Roosevelt Way NE. 6-8 PM. FREE. ABOUT: Magicians doing their thing on the second Monday of each month. ABOUT: Judy Bower explores the pattern of a woman’s heroic journey in contrast to a man’s in her book Jane Eyre’s Sisters: How Women Live and Write the Heroine’s Story. ABOUT: “Erased is a dance theater piece conceived and choreographed by Dani Tirrell in collaboration with Color Lines Dance Ensemble. Through movement, live singing, spoken word and video, Color Lines Dance Ensemble tackle issues of race, misogyny, colorism, hair, body image and the complex but rewarding relationships women of color share with each other.” – STG website. This performance is part of a series of free, all-ages summer events at The Neptune Theater, Night at the Neptune. See the full 2015 lineup here. DETAILS: The Neptune Theater, 1303 NE 45th Street. Doors open at 6 PM, show at 7 PM. RSVP here. All-ages. FREE. You probably already know it but the forecast calls for a sunny and HOT weekend with temperatures in the upper 80s and low 90s. ABOUT: Electronics, clothing, miscelaneous household items, tools, camping stuff, a raft, sewing machines, artwork, movies, collectable comics, jewelry, etc. DETAILS: Thursday, Friday, and Saturday. 6802 Roosevelt Ave E. 10 AM-6 PM. ABOUT: Kids decorate their bikes, trikes, or themselves march in this approximately 2 block parade. Turn around and repeat! DETAILS: Parade begins at 11 AM at the corner of NE 73rd and 18th Ave NE. ABOUT: The MaxMobile is the Humane Society’s mobile adoption and education unit with cats, dogs, or other critters available for on-the-spot adoption. 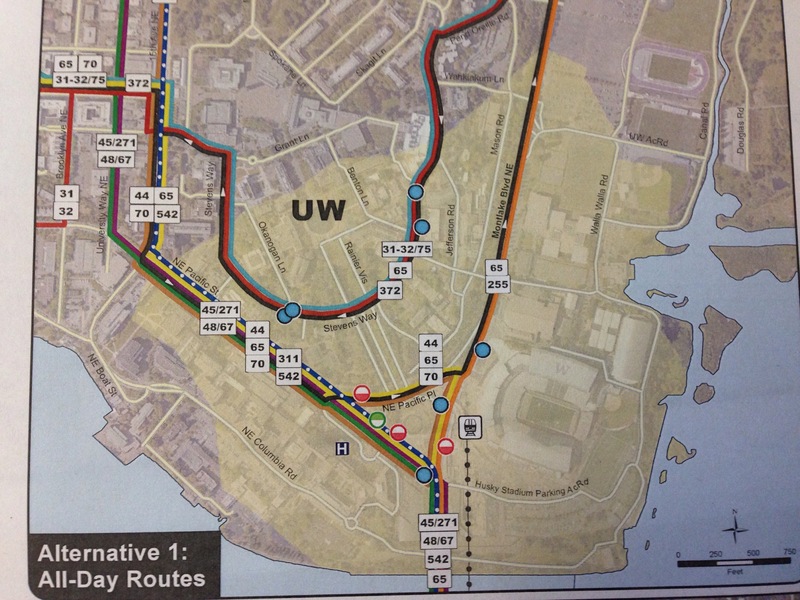 DETAILS: MaxMobile is parked outside the Ravenna Gardens building (#79 on this map), 3-6 PM. Movie showing at the Seattle Public Library’s University Branch. ABOUT: Free movies showing at several library locations around Seattle. Watch “Roman Holiday,” the second movie in Americans Abroad: A Globetrotting Film Series at the University Branch. ABOUT: This is the fifth year of summertime outdoor movies on a big screen, live entertainment, trivia, and food trucks on Thursdays evenings from July 9 – Aug. 27, 2015 at Magnuson. Bring your own lawn chair or blanket and events are dog friendly. STG presents Ben Hunter and Joe Seamons in the The Rainier Valley Revival. ABOUT: “Ben Hunter & Joe Seamons collaborate with students from Washington Middle School’s roots music program to tell stories and perform songs celebrating the history of the Rainier Valley. Through interpreting the music and culture of our local heritage, this concert will contribute to a revival of the wonderful stories and traditions that have lain dormant for too long!” – STG Website. This concert is part of a series of free all-ages summer events at The Neptune Theater, Night at the Neptune. See the full 2015 lineup here. DETAILS: The Neptune Theater, 1303 NE 45th Street. Doors open at 6 PM, show at 7 PM. FREE. 80 Days of Summer at the Burke Museum of Natural History. DETAILS: The Burke Museum of Natural History and Culture, UW Campus at 17th Ave. NE and NE 45th St. Open daily, 10 AM-5 PM but CLOSED for the 4th of July. Activities included with museum admission, $7.50-10. 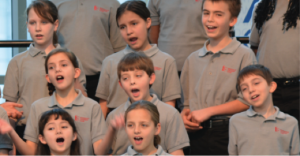 Thirty young singers from the internationally recognized Indianapolis Children’s Choir are performing in the inaugural Philanthropy Through Song Concert at the Sand Point Community United Methodist Church (4710 NE 70th St.) this Saturday, June 27, at 4:30 PM. The choir is under the direction of Ruth E. Dwyer, who is also the founder and artistic director. Dwyer is the sister of Judy Dwyer Schulte, and aunt of Ravenna neighborhood friends Dan, Karina and Elias Schulte. Please join members of the Sand Point UMC Choir, Les Martin (Director), and the Indianapolis Children’s Choir in a joyful concert of hope, joy, endurance and the celebration of those who help one another. A free will donation will be taken with proceeds going to anti-drunk driving education and traumatic brain injury research and therapy. The forecast calls for a partly sunny weekend with temperatures nearing 60 degrees. Donate your spring cleaning purge to the Annual Eckstein Middle School Band Rummage Sale. Drop off items in the school cafeteria at 3003 NE 75th Street between 1:30-4 PM. (The cafeteria’s exterior entrance faces the garden area in the back parking lot.) Items accepted include clothing in wearable condition, household items, books, music, furniture, toys, games, puzzles, and sporting equipment (no unassembled furniture, carseats or strollers). Listen to local live jazz with friends and great coffee. North End Jazz Quintet at Wayward Coffee House, 6417 Roosevelt Way NE. First Saturdays 8-10 PM. No Cover. Score some bargains and support young musicians. Annual Eckstein Band Rummage Sale, in the lunchroom and parking lot of the school at 3003 NE 75th St. Baked goods and music from the school’s jazz combos will also be on-hand. Money raised is used to offset some of the cost of off-camput music performances, repair damaged instruments, and provide scholarships to children who need assistance. 9 AM-3 PM. FREE. Add to your collections of gardening books or botanical illustrations. 10th Annual Garden Lovers’ Book Sale at the Center for Urban Horticulture, 3501 NE 41st St. The used book sale benefits the Elizabeth C. Miller Library’s purchase of new books and magazine subscriptions. 9 AM-3PM. FREE. Hop on over for your annual neighborhood Spring Egg Hunt. 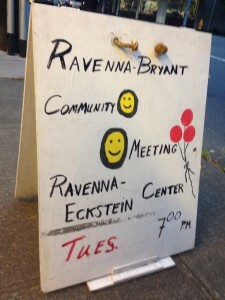 Ravenna Eckstein Community Center, 6535 Ravenna Ave NE. 10-10:15 AM. FREE. Take the kids for pajama story time and drawing demo followed by free gelato. Pajama Storytime with author/illustrator Christa Pierce at Ravenna Third Place Books, 6504 20th Ave NE. 7-8 PM. FREE. SUNDAY, April 5 – EASTER! 10th Annual Garden Lovers’ Book Sale at the Center for Urban Horticulture, 3501 NE 41st St. 9 AM-3PM. FREE. Play a bookworm’s dream board game. Bring Your Own Book Game Night at Ravenna Third Place Books, 6504 NE 20th Ave NE. Bring a book and then search for text to satisfy a selected prompt. 7-8 PM. FREE. We’ll likely see some rain on Saturday with temperatures in the mid-50s but Sunday has some potential for sun and slightly warmer temperatures. Watch and discuss a social justice documentary film. Meaningful Movies at Keystone Church, 5019 Keystone Place N in Wallingford. Showing Uranium Drive In in which a rural community in Colorado debates a proposed uranium mill. Every Friday, 7 PM. By Donation. Phinney Neighborhood Center Preschool Co-op’s Kids Sale in the Community Hall of the brick building at 6532 Phinney Ave N. Items include clothing, toys, books, strollers, furniture, gear, and maternity wear. Many items discounted 50% starting at noon. Get a peek at some goodies up for sale here. 9 AM-1 PM. FREE. Sample wines from Elk Cove Vineyards at your local wine merchant. Attend an all ages variety show. Evan’s Family Variety Show in the brick building at 6532 Phinney Ave N. Magicians, jugglers, dancers, circus artists, etc. FREE but tickets required. Register HERE. Listen to original poetry by Lincoln Elementary 5th Grade Students. Haiku, Odes and more: A Celebration of Youth Poetry at Ravenna Third Place Books, 6504 20th Ave NE. The students have collected their poems into a book that will be available at the event. March 24th 7-8 PM. FREE. Cozy up in your pajamas for stories and puppets. Pajama storytime at the Northeast Branch Library, 6801 35th Ave NE. Bring your preschoolers and toddlers to enjoy stories, rhymes, songs and fun with the children’s librarian. 7-730 PM. FREE.